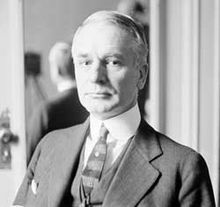 Olympus, Pickett County, Tennessee, U.S.
Cordell Hull (October 2, 1871 – Julie 23, 1955) wis an American politeecian frae the U.S. state o Tennessee. He is best kent as the langest servin Secretar o State, hauldin the poseetion for 11 years (1933–1944) in the admeenistration o Preses Franklin Delano Roosevelt durin much o Warld War II. Hull received the Nobel Peace Prize in 1945 for his role in establishin the Unitit Naitions, an wis referred tae bi Preses Roosevelt as the "Faither o the Unitit Naitions."